Reverend Father Lloyd Francis Benoit, Jr.
Father Benoit is a native of Arnaudville, LA. His seminary studies were at Immaculata Seminary in Lafayette, St. Joseph Seminary in Covington, and Notre Dame Seminary in New Orleans. He was ordained on June 16, 1990. His assignments prior to Church of the Assumption were St. John Cathedral in Lafayette, St. Joseph in Cecilia, Holy Rosary in Kaplan, and St. John the Baptist in Lyons Point. 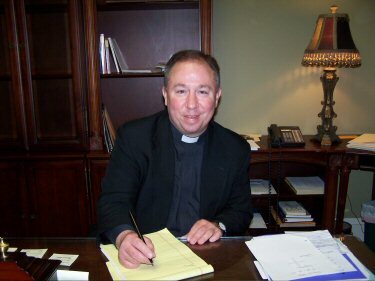 He became pastor of Assumption in 2007.